Check the locations where you will be staying or traveling. Simply find those stations on our booking form pulldown menu. Can’t find the exact station but want to know the closest station? 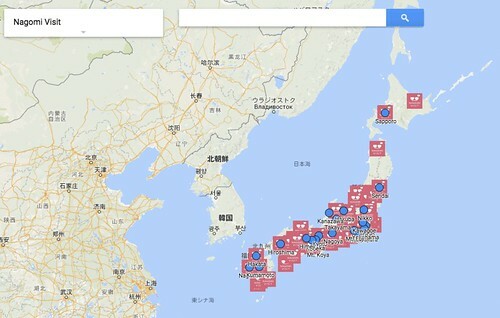 Use our map which shows all our Nagomi Visit host locations, basically where the pink logos are placed. Type in a station name or address using our map and check to see which Nagomi Visit stations are the closest. Look for our pink square logos. 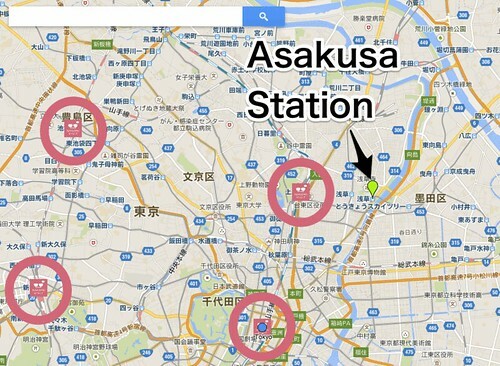 For example if you are trying to find the nearest station from Asakusa then you will see that Ueno Station is the closest using our map. Need the host to be nearby? Add your distance requirement (e.g. within 30 mins) in the Preferred Host Type column on our booking form. However, be cautious when making this decision to add a distance requirement, keep in mind that there will be more chances of finding a great hosts if there are less restrictions. Also that our hosts are easily accessible by train. However, if you are only in Japan for a few days and have time restrictions then we also recommend including the station where you will be coming from and that you are looking for someone nearby that station.